I'm rereading Shogun for what must be my fourth time since 1992, and as always am struck by parallels between the honor-shame values of medieval Japan and the ancient Mediterranean. Stephen Carlson and I have blogged certain comparisons in the past (Stephen about the proper understanding of grace, I about breaking promises), and now I want to consider what undoubtedly hits every reader of Clavell's novel as the strongest contrast between European and Japanese values in the sixteenth century: the view of death. To what degree does the "ready" acceptance of death in medieval Japan parallel the views of ancient Jews and Christians? In Shogun samurai commit seppuku ("hari-kari", suicide by disembowelment) left and right, on the whim of a liege lord, and they do so proudly; it's an honorable way to die. As readers we share the point of view of the English pilot John Blackthorne, initially appalled at such nihilism, then gradually coming to appreciate the dignity in seppuku. In Learning from Shogun: Japanese History and Western Fantasy, Asian scholars William Lafleur and Henry Smith each critique this portrayal. While accepting the obviously common reality of seppuku at the time of 1600 AD, they believe Clavell has exaggerated aspects of the phenomenon. Lafleur claims that he has overstated a contrast between East and West, and Smith charges that it's too extreme to characterize the Japanese as warriors who actually look forward to death. "It is possible, however, to give quite a different interpretation to all the talk about 'the honor of a noble death' in the writings of late medieval Japan. The frequency and insistence of such references may, in fact, suggest that for the Japanese themselves such attitude could be made to appear 'natural' only through constant justification. The instinct for self-preservation has, after all, through millions of years remained fundamentally natural to creatures still in the prime of life. A fear of death was, then, as natural for the late medieval Japanese as it is for any other people; what is interesting about their society in that period was the elaboration of cultural mechanisms to contravene such natural fears. 'Bushido' is in many ways precisely this. But its existence as a code or norm does not in any way indicate that reality in the sixteenth century, for instance, was anything like the ideal or that large numbers of Japanese -- as Clavell depicts in Shogun -- walked willingly into death. The flaw in this critique is that ancient Greco-Roman philosophers and Jewish/Christian martyrs hail from the honor-shame milieu of the ancient Mediterranean, even if parts of the region may be thought of as "the West" to an Eastern scholar like LaFleur. Biblical specialists like David Seeley, Stephen Finlan, and Jeffrey Gibson have written about the noble death theme, particularly with respect to Paul's death metaphors. In IV Maccabees the Judean heroes are understood to defeat tyranny by courageously dying for the Torah, and inspiring others to do so as well, and Greco-Roman philosophers died in order to free others from the fear of death, again as vicarious models. LaFleur's examples aren't the best, because he's appealing to a place and time sharing honor-shame values similar to (though in many ways different from, to be sure) medieval Japan. 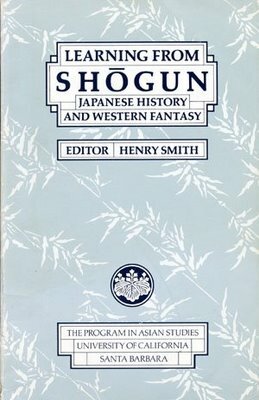 Of course, LaFleur was writing his critique of Shogun in 1980, well before the genesis of the Context Group. And on the last point Smith concedes that Clavell gets it right: if the only way to avoid dishonor was through death, then so be it. Samurai faced and accepted death without hesitation -- for indeed honor was more important than life itself -- but that hardly means they looked forward to it. I'm wondering, however, if Smith is misrepresenting Clavell, at least in part. His critique gives the impression that Shogun portrays samurai as looking for any excuse to die ("yearning" for death, "seeking" it out), but that's not the case. In the cases of Yabu and Buntaro, each goes out of his way to avoid death, try every possible means of self-preservation, and in general to achieve plenty in life. Only when all seems completely hopeless (Yabu stranded at the base of a cliff with the tide rushing in, Buntaro completely cornered by the enemy and about to be captured -- the most shameful fate for a samurai) do they prepare to kill themselves; only at this point do they "look forward" to death as an escape from "the abyss of life", which surely must be understood relatively as accepting one's karma and moving on to something better (like nirvana). I never understood Yabu and Buntaro's tranquil acceptance of death as a negation of the more frequent affirmation of life. These characters crave the end only when all avenues to self-preservation have been exhausted. What I find most fascinating is that when Clavell was interviewed by scholars like Smith and Lafleur, he characterized the fear of death as a "stupid part of the Jewish-Christian ethic" (he was raised Protestant, like the hero of his novel, John Blackthorne). But the Maccabean martyrs and the gospel/Pauline portrayals of Jesus show that the noble death theme is rooted in the earliest parts of the Judeo-Christian tradition. With regards to suicide, Shogun makes much of the harsh Christian view, and it's true that by Blackthorne's time suicides were consigned to hell by European Catholics and Protestants. But the bible itself is a Mediterranean product, and while it hardly lends support to a ritual like seppuku, it is nonetheless silent on the fate of those who take their own life. It would seem that the theme of death owes more to cultural values than religious ethics per se. In the next post we'll address the theme of love. It is interesting that Paul in Galatians talks of Christ in reference to the cross as "giving himself" (1:4, 2:20). In effect, this is converting an execution into a suicide (by cop). Except that there is a difference between suicide and self-sacrifice.